Gotta love Toby Mac… Resilient, enduring. He has been blessing people with his music for a very long time. And he’s right, of course. When I was a little girl it was more, “if you can’t say anything nice, don’t say anything at all.” “Speak life” is much more positive. My daughter is the first one I can recall using this phrase. It’s an instant change in conversation, in thought process. It stops me in the middle of my current train of thought and makes me choose another path. One that is less about me and more about the other person. It builds up rather than tears down. Isn’t that what we are about in this life, on this Christian walk? Building others up, esteeming others as more important than ourselves? Thanks for the reminder Toby. I come from a line of musical people. My mother was a phenomenal alto all my years growing up. She sang in the church choir, and any other time she could. My second memory of singing in front of people was a duet with my mom at Dearborn Heights Baptist Church in Michigan, where I grew up. I sang lead, mom sang alto. We did an old hymn, and I can still hear it in my head… “I come to the garden alone, while the dew is still on the roses…” In two parts, of course. I was all of 8 or 9 years old and I thought I was BIG stuff. It’s one of my favorite memories. I don’t remember being afraid or nervous, though I’m sure I was. My grandfather (mom’s dad) had a big bass voice and was the song leader and choir director at his church for 58 years! The last few years, he had to sit, and they gave him a huge trophy when he finally retired. Back in the 1940’s, he sang old-time gospel music with the Graham Quartet in western Kentucky on the radio. Momma would get to go with him sometimes, and occasionally he’d let her sing on the radio with them. I don’t remember a time in my life that doesn’t involve singing, except a couple of years ago. I had cervical spine surgery in July 2012. Of all the many things that “could” happen, none did. EXCEPT that my voice was gone. I could still talk, mind you, but I couldn’t sing. At all. No range, no volume, no quality, nothing. I grieved. The surgery sort of came out of nowhere, so I didn’t really have time to plan, or think. If I’d known this would be a side effect, I would have sung one more song. But I didn’t know, so I wasn’t worried. You see, once I’d gotten in front of an audience, I craved it. Besides singing at church, I sang in the car, in talent shows at school and at the Lincoln Jamboree in the county where I went to high school. I was a voice minor in college, and did musical theater. Everything from the sublime to the ridiculous. So for me, not singing was not an option, because, aside from loving it, singing and playing (piano) was my worship. That’s how I expressed myself to God. After the surgery, I couldn’t talk about it… At least not without crying. My heart hurt. I had spent a lifetime with the ability to open my mouth and make a joyful (and sometimes not so joyful) noise. What would I do now? My doctor was very good and very understanding. He set me up with the most wonderful speech language pathologist, who is now my dear friend and a 2nd daughter to me. Also during those months, I began waking with music in my head. Familiar and unfamiliar, old and new, music complete with orchestration and voices. I remember the first time it happened, I woke up so excited!!! I had dreamed that I was singing and it was beautiful. When I awakened, there was music in my head… Not my voice, but just like a radio playing. And I thought, “at least I can still sing in my sleep, I can still sing in my spirit.” Again, I cried. My dear friend, Karen, told me in the darkest days of grieving all this that God would restore my voice. She reminded me that my gift would be returned to me (Luke 6:38). This month, I had the great privilege and joy to tell her she was right!!!! Though my range is reduced some, and it’s a little unpredictable at times, I can sing! And I DO! Any chance I get. And the very best part?? The songs in my head keep coming… Every morning. Words cannot express how thankful I am. OH! And my FIRST memory of singing in front of an audience?? Five years old, at the Christmas party for my dad’s employer. They talked me into standing in front of a microphone and singing “All I want for Christmas is My Two Front Teeth.” I was missing my two front teeth and I promised that I knew all the words… NOT! Not the old hymn that most people know… The one that has like six verses. While that’s a tested and true old classic, I can take or leave it. I don’t dislike it, but when you’re a church musician your whole life, there’s only so much improv you can do with it. And it gets requested over and over. No, I woke up in the wee small hours with this song in my head and I thought, “I’m going back to sleep. Maybe it will change.” It didn’t. When my clock went off, the refrain was running through my mind… And the refrain is just about all I know of this song. This Is a Phil Wickham song. Though I’m not a huge fan, I love these lyrics. I’m seeing a trend this week! I’m so glad God had other plans. I am thankful for His amazing grace, His unfailing love. The cover image for this blog post is a watercolor I did this weekend of a photo I took when I was in Rabat, Morocco last fall. (See original photo below.) 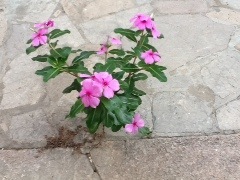 I saw these beautiful blooms standing tall and proud in the middle of a stone walkway… A symbol to me of Gods unfailing love. If He cares so beautifully for this flower in the rock, how much more he must care for his children. And I’m glad God is the one choosing the play list every morning!!!! It’s Saturday morning and my eyes pop open at 5:10 a.m. (I checked.) So here I am before 5:30 with a cup of coffee in my favorite room in the house getting this all down before I forget. One day He’s coming, oh, glorious day, oh, glorious day. The first time I heard this song, I wept. You see, Easter is my favorite holiday, hands down, because we get to celebrate the risen Christ. I love how the darkness of the Lenten season becomes bright and sweet on Easter morning. I get excited about the music of Easter… I always have. So, here I am, in the perfect quiet of early morning… Not a sound anywhere except this song in my head. And the best part is that I know it will be with me all day… Reminding me there will be a day when Jesus comes back, with no more pain, no more tears, no more sorrow or grief. I don’t know if my spirit was singing this song because I’m looking toward Easter, or because I’m so glad there will be a day that is so glorious… I’m just so thankful it sings!! It was odd to wake up this morning with these words singing in my head… Audio Adrenaline will definitely WAKE YOU UP in the morning!!! I can push back the mountains, can stand on the waves, I can see through the darkness, I’ll hold up the flame. Take me to the ocean… I want to go deeper. I’m not afraid no, I’m a believer. It’s what I want… to go deeper with God. Deeper into the Word. Deeper into what he has planned for my life. My future is really up in the air right now in some ways, but I’m not afraid. I know that God has other plans for me, even though I don’t know what they are. Waking up with this song in my head gives me confidence that my spirit trusts what God has in store, even if my brain gets in the way sometimes. My spirit declares that I AM a believer in the one true God and none other. I reminds me to give up myself, let go of control of my life and give it to God. Today and every day. and with the saints I will tell my story. There will be one name that I proclaim. Jesus. Jesus. Jesus… There’s just that name. There’s more, and this isn’t one of my all time favorites, but I love how this song is joyful, happy, uplifting, praising The Lord. It’s easy to sing along with and I turn it up in the car. In my head it is turned up loud. Waking up with this song makes me feel as though my spirit was dancing and singing before The Lord in my sleep (which is going some because I am NOT a dancer!) Watching the Son rise and Singing with the saints in glory!